Thanks to their parents’ hand-held devices, tablets and computers, Babies everywhere are tapping or thumbing keyboards and finger-swiping screens, honing digital skills while living their Baby lives. What fun I had bringing this newest of worlds to the sturdy pages of the ultimate hand-held device: the baby board book. What fun it was adding that human touch to Touch Technology. 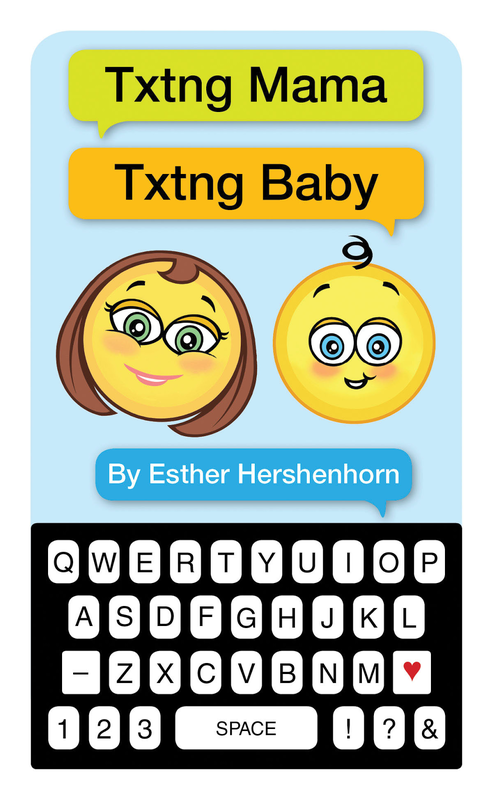 Be sure to read to the end of this post to learn how two TeachingAuthor readers can win a free copy of Txtng Mama Txtng Baby. I love so many things about this 4” x 6 ½” book, starting with the cheery cover and the ♥ key on the keyboard. I love the story- a playful through-the-day conversation between Mama and Baby that invites interaction. I love the telling – tunefully-ordered familiar text phrases, such as I C U and xxooo, that beg to be repeated. I love the illustrations – baby-friendly emoticons that instantly bring smiles. I love the smart-phone-look-alike design, so readers and listeners can turn (or swipe) the pages. In truth, my grandson gifted me with this book before he was born. Awaiting his arrival, my Baby Antennae rose far and wide. Everywhere I looked I saw Mamas thumbing their hand-held devices and nearby, Babies finger-swiping the same. Texting Mamas, I said to myself. In time I read the handwriting on the wall and it was written in text! Cartoon ©2013 Harry Bliss; Used with permission. Fortunately by then, the four words texting Mamas texting Babies had become a refrain that book-ended a dialogue that eventually gave birth to a baby board book. The vision and efforts of my Sleeping Bear Press publisher Heather Hughes, editor Amy Lennex and art director Jennifer Bacheller contributed immeasurably to the book’s singular look and telling, not to mention its caring delivery. Of course, anyone who knows me, and not even well, knows I am The Least Likely Person to Have Created This Book. I have the heart of a Luddite. Technology and I don’t play well together. Ironically, my very first foray into children’s book writing was another baby board book, inspired by my grandson’s Poppy, my then one-year-old son, in 1976: THE A TO Z OF ME. I’d created a personalized ABC book, with plastic inserts for renewable photos, to capture a baby’s loves and life. Publishers and toy companies embraced the abecedarian story but regrettably turned it down due to my telling’s exorbitant manufacturing costs. Who knew what was coming down the pike?! By the early part of this 21st century, the Internet offered any parent free software and POD opportunities to help create and publish a personalized ABC book for his or her child. So here’s one more thing I love about Txtng Mama Txtng Baby: 2day’s Techy-Techy World is my story! And my message remains the same: Mama ♥ Baby. Be sure to return Wednesday, for a Writing Workout that utilizes this newest of languages - text, then again on Friday when I share not only a text-written poem to honor Poetry Friday, but truths I gleaned from my research on Babies, Toddlers, Texting and Technology. 10 Q 4 letting me share my Good News. C U Wednesday 4 a WWW! And now, for the Book Giveaway Details! Once again we’re using Rafflecopter to give away two signed copies of Txtng Mama Txtng Baby (Sleeping Bear Press)! If you've never entered a Rafflecopter giveaway, you may want to read HERE about how it words. And click HERE to learn the difference between signing in with Facebook vs. signing in with your email address. If you enter via a comment to this blog post, please tell us your favorite emoticon--think the : and ) that create a smiling face, or an initialism, such as OMG. The giveaway will run from today, August 5, through August 13, 2013. To celebrate the arrival of the book in the warehouse, we've extended the giveaway through August 20, 2013! Winners will now be notified August 21, 2013. And congrats on your new book! I can't wait to read it! O U QT U! This looks like fun! Congrats, Esther! Gr8! Perfect shower gift for all those techy mommas 2B. LOL! 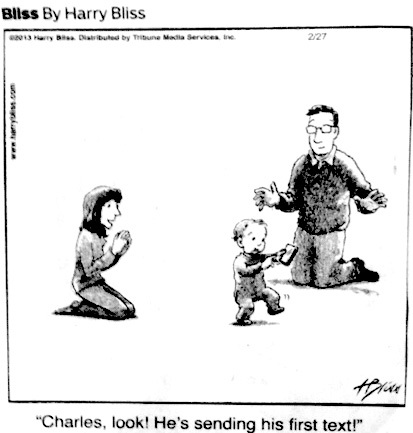 I am not up on the texting world but do have (another) grand baby due in September, whose daddy is a computer expert. So it'd be great to win your book, Esther. If I don't, I'll buy it. My editor's adult daughter often responded to his advice with "LOL," which he thought meant "Lots of love." He thought she was expressing her love and treasuring his suggestions -- until someone translated for him. Congratulations and I WANT TO WIN! This sound's like Eleanor's perfect book. She loves her parent's iPhones. I'm not much for emoticons, so I don't have a favorite, but I am happy for the birth of your new book! Congratulations! It's nice to see folks entering our Book Giveaway too. I've been - anxiously (!) 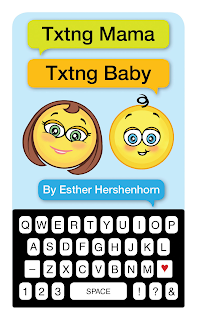 - awaiting response to my board book, so hoping it would bring smiles while bringing today's babies' digital world - and newest of languages - to the page. What a great idea for a book! My 3 yr. old granddaughter and 1 yr. old grandson are already doing all sorts of cool things on the computer. I know they would love this book. I don't text so I'm not really too familiar with emoticons, but last spring I saw one of my students text the new boy, "U R a QT!" Not much on emoticons, Esther, but I "heart" your good news and will make sure to spread the word AND get this charmer into my local library. All the best to you and this book! Thanx, Anne and Linda, for cheering on TXTNG MAMA TXTNG BABY! It should be arriving in stores by the start of next week. What a cute and current idea!! I've added your QT "Pie" symbol, Leanne, to my list of txt words that sits on my desk! And, thnx for the Congrats Kelly. Thanks, Kathy, for teaching me some clever txt vocab! And thanks, Colleen, for your Support. We've extended our Book Giveaway Deadline to Aug. 20th! I hope you both enter. Congratulations, Esther! So happy to see your board book out in the world! I sure hope you entered our Book Giveaway! I LOVE the whole concept of your book - what a great baby shower gift; new mommy present, etc. etc. Love great ideas. And emotioncon I finally learned how to make a heart <3 -- < and a 3 - how simple is that. How nice to know you two are reading our blog, Buffy and Sharron! Thanks for the Kind Words and Congrats. I'm pinching myself that this gift of an idea from my grandson-in-utero finally became a book. Esther: This is awesome. I'm behind on my e-mail, so I'm behind entering this, but so glad that I found out on the last day. Congrats. My daughter is a screen swiper, and she's not even three. She loves to play on the tablet. She loves to color pictures on the tablet. I told her sometimes she needs to use real markers! HA! Would love to win!